Europe’s auto exporters are irked by Russia’s “scrappage tax” amid mounting environmental pressure. When Russia’s record 18-year-long bid to join the World Trade Organization finally concluded successfully last year, one of the last major stumbling blocks concerned car important tariffs. For the last decade Russia’s government had skillfully been using a carrot-and-stick approach to get major auto giants to produce cars (and eventually – car parts) in Russia, which was suddenly under threat. The negotiators reached a compromise: duties on imported cars would decrease from 30 percent to 15 percent and on buses from 10 percent to 5 percent by 2018, making the country’s burgeoning $70 billion auto market more available than ever to Europe’s geographically adjacent producers. But there was a catch: during September of last year (dubbed the “Year of Ecology” by none other than Vladimir Putin), the country’s parliament passed a law implementing a car recycling (or “scrappage”) tax on all imported autos. The E.U. cried foul, saying it amounted to nothing more than veiled protectionism. Fredrik Erixon, Director of the Brussels-based European Center for International Political Economy, called the tax “blatantly discriminatory,” adding “Russia is going to find itself being sued by a lot of different countries” in an interview to Reuters. The tax ranges from $550 for certain new cars up to $55,000 for old trucks (the amount increases with age and recycling cost). The move brought over $200 million into Russian coffers in the first two months after implementation alone, according to AForex analyst Narek Avakyan. This is not surprising given the country’s generally old car fleet: 22 percent of the cars on the road are over 20 years old. Meanwhile, scrappage rates stand at 1-3 percent (less than half of Europe’s 6% average), making car recycling and ecology an urgent issue for Russia’s booming car market. 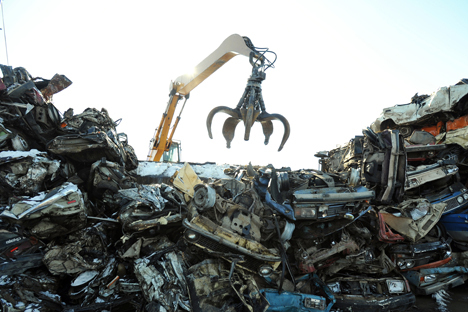 Russian producers have been exempt as long as they committed to setting up an auto recycling drop-off center in every region with over 500 thousand residents (in some remote parts of the country car manufacturers have teamed up to set up the centers, reported business daily Kommersant). However, the E.U. doesn’t believe that local automakers will ever implement this commitment and that they therefore enjoy an unfair advantage in price. “[After Russia joined the W.T.O.] Europe had expected a real cut in duties,” explained Sergei Udalov, Director of the Avtostat analytical agency. In response to the criticism Russia’s government recently announced that all manufacturers would have to pay the tax by year’s end, thereby creating a level playing field and protecting the environment. “The ideal option from the point of the W.T.O. would, of course, be no charge whatsoever,” added Udalov. A total removal of the charge is out of the question because it also protects local players, mostly represented in the lower price segments, from imported used cars (for which the tax is higher). “This is a critical issue for the country’s truck companies, which have actually done well since the Soviet collapse. Dumping prices by foreign producers could significantly undercut the competitiveness of companies like Kamaz, considered strategic by the government,” said Bogdan Zykov of BKS Express.